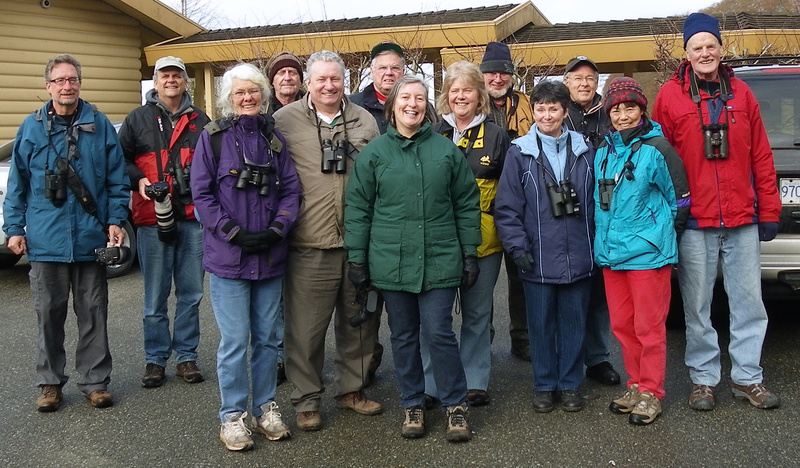 Sixteen birders enjoyed a pleasant, for a change no rain, Monday morning of birding to the Heronry at TsaTsu Shores, through the Tsawwassen First Nations (TFN) Reserve to Alaksen Wildlife Management Area and then to Reifel Bird Sanctuary. I forget who was with us, so you will have to check out the outing photos, including the obligatory Group Photo, on our Picasa site at http://picasaweb.google.com/dncbirding. I do remember there were several couples including: Rick & Marg, John & Kay, Newbie Jim & Kathleen, and Roger & Mike. Hi-lites of the morning were: hundreds of Great Blue Herons (GBH) nesting at TsaTsu, Barn Owl, 12 Greater White-fronted Geese, several Canvasbacks, American Bittern, many waterfowl pair in breeding plumage, and Margaret’s tasty squares. Our convoy of six vehicles (too many, we must carpool more) started at TsaTsa Shores to see the Heronry. There were GBH’s on nearly every branch; amazing sight. Seemed like many more than the estimated 200 nesting pair of last year. The “guardian” Bald Eagle was sitting on her nest in the middle as Dad circled nearby. A Red-tailed Hawk was perched in a nearby tree as we entered the TFN Reserve and stopped at the Kingfisher Bridge. No Kingfisher today; the water was fairly low with a lonely Green-winged Teal and a Song Sparrow were there. Northern Flickers were screaming and someone saw a swarm of Dunlin in the distance. The drive through TFN and the Ladner fields was uneventful, other than a big detour past the massive TFN construction and a parked train blocking the road across the Deltaport Way. Some saw a Cooper’s Hawk and Red-necked Pheasants, but no Western Meadowlarks and the Northern Hawk Owl left Westham Island about two weeks ago. The Trumpeter Swans and Snow Geese seemed to have all gone north to Russia as well. We stopped at Hugh’s farm to see the beaut Barn Owl, but we could not find the chick that Luke, Britt, Ciel and I saw there on Sunday. We were skunked on the Barred Owls at Alaksen as well, although there were lots of pellets beneath the conifers. Then a brilliant male Common Merganser and an equally-brilliant male Hooded Merg coasted by us for nice photo ops. Lots of newly-arrived Tree Swallows around and another Bald Eagle pair entertained us around their nest; one of 58 known active Bald Eagle nests in Delta, now the new unofficial Eagle Capital of the World. Noisy Red-wing Blackbirds were everywhere. I missed seeing BSC’s (and another of my Gurus) Peter Davidson as I was busy savouring one of Marg’s delicious treats that she made to celebrate her and Rick’s one-year DNCB membership. Peter said some Warbler, Thrush and Wren species have been seen at Alaksen, of course, not by me. Reifel was Reifel, the best place in the Lower Mainland to see birds, mainly waterfowl, up-close-and-personal. The Black-crowned Night Herons were there, tonnes of Fox, Song and Golden (not yellow)-crowned Sparrows at the feeders. Gorgeous Wood Duck pairs were hanging around new nesting boxes. We were entertained by many colourful pairs of breeding plumage birds including: Bufflehead, both Lesser and Greater Scaup and Ring-necked Ducks, Hooded and Common Mergansers, 12 (not very common) Canvasbacks, Northern Pintail, Northern Shovelers, Green-winged Teal, Gadwall, American Wigeon and of course lots of Mallards and Canada Geese. 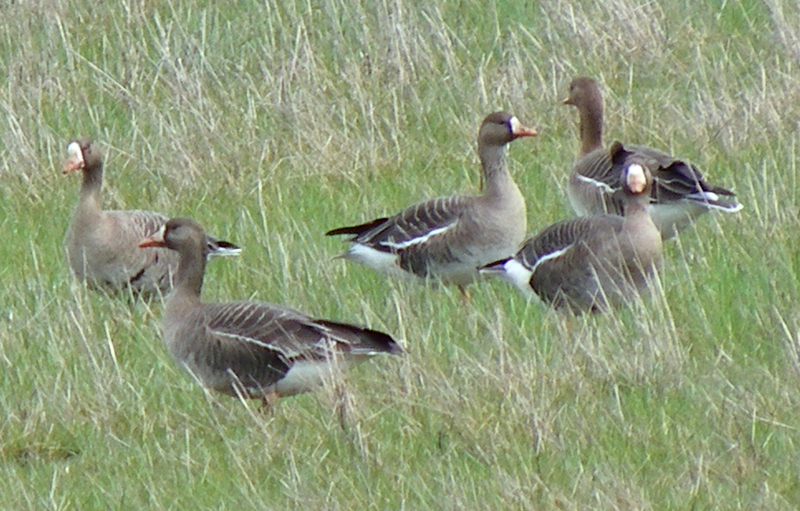 Twelve Greater White-fronted Geese were in the field along the east dike. Unfortunately, we could not locate the three Sawhet Owls and the Long-eared Owl that we saw there on Sunday. Several Marsh Wrens were singing and Kinglets calling. Northern Harriers occasionally “collided” as they glided by. The white, leucistic Mallard (that I first saw as a new-born baby two years ago) was there with other weird hybrids. We looked for the American Bittern, and one of our humble and vastly under-rated participants, and a super guy to boot, found it obscurely hidden in the reeds. A nice way to end a very enjoyable morning. I will be at Petra’s around 7:30 a.m. next Monday, April 4 for departure at 8:00 a.m. on an outing “somewhere around the Bay”. Again, comments welcome, check out our Blog at www.dncb.wordpress.com, and tell me if you don’t want to receive this drivel. This entry was posted in *DNCB, Alaksen NWA, Barn Owl, Reifel, TFN, TsaTsu Heronry. Bookmark the permalink.